I live about 4 km from Surin Beach in Cherngtalay; it's been my home for only the past 6 months but I've been traveling here for the past 4 or 5 years. Like so many small beach areas in Phuket, dining establishments come and go with the tourist. There's no guarantee it'll be there in 4 months, much less next season. The crowds at Surin Beach this season were large, hence more money was spent sprucing up existing restaurants and investment dollars were spent creating new spots. Although my all time favorite restaurant on Surin Beach continues to be TASTE Restaurant, I thought I'd tell you about some darn good pizza at a little place called La Traverna on the beach. Some fellow students at the Surin International Language School (yep, I'm trying pood pasat Thai) claimed that they thought it to be the best pizza in Phuket. So with camera in hand and Miss Penny (my 9 month old Jack Russell Terrier) on leash, we headed for a few hours of fun at Surin Beach. Lunch was a nice affordable treat and the pizza was great. The restaurant makes my top 5 list for the simple fact that without asking, I got a cracked pepper grinder placed on my table - gosh, I felt at home! Not to judge a restaurant on only one try, I returned a week later for an evening meal with my husband and another friend. 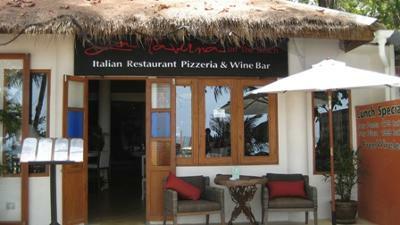 The Caprese salad was a hit, and probably the best I've had in Phuket..next to from my own kitchen. Anyway, if you find yourself at Surin beach for lunch or dinner, and feel like a bit of Italian, give La Traverna at the beach a try. You'll find it at the south end of the beach beyond Taste, Pla Seafood, and Stereo Lab. Do NOT get it confused with the pizza restaurant to the north of the parking lot..you'll be desperately disappointed.